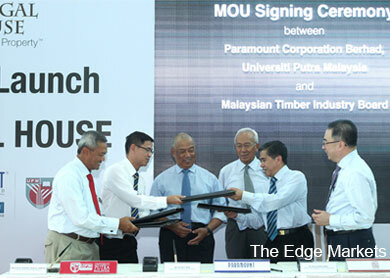 KUALA LUMPUR (Oct 21): Paramount Corp Bhd has teamed up with Universiti Putra Malaysia (UPM) and the Malaysian Timber Industry Board (MTIB) to jointly promote the use of Malaysian wood. The three parties today signed a Memorandum of Understanding (MoU) after the launch of Paramount's Chengal House here by Deputy Prime Minister Tan Sri Muhyiddin Yassin. "This partnership is a clear demonstration of how the government, the industry and academia can merge and expand our resources to achieve so much. Not just for our individual entities, but also for the country and its future," said Muhyiddin. Under the tripartite agreement, Paramount will promote the use of Malaysian wood in property and private education, while UPM will focus on education and forestry and MTIB will provide expertise in the promotion of timber products. Paramount chief executive officer Jeffrey Chew said the MoU is an expression of the property developer's commitment to explore the use and application of timber in both its property development and education businesses. "In property, UPM and MTIB will work with Paramount to explore the use and application of timber in construction – not just in design and detailing, but also as a structural material," said Chew. Meanwhile, UPM and MTIB will work with Paramount-owned private school, Sri KDU to extend their Eco Schools programme to include the study of forests, trees, plants and wood preservation and organise field trips to UPM's forest reserve and MTIB's timber application facilities. MTIB director-general Dr Jalaluddin Harun said private sector participation in promoting the use of timber as building material will help the industry achieve the "uphill task" of generating RM53 billion million in export revenue for Malaysia by 2020 as stated in the National Timber Industry Policy (NATIP). Last year, Malaysia's timber industry raked in only RM20 billion in export revenue. Jalaludin said Malaysia should move away from exporting timber as a commodity towards exporting value-added timber products such as building materials to achieve NATIP's goals. Earlier, Paramount, UPM and MTIB had collaborated to construct the Chengal House, which is an 11,000 sq ft clubhouse located at Paramount's Sejati Residences high-end residential development here. It was constructed using 200-year-old recycled chengal wood as a key element. Chew hopes that the Chengal House will be the starting point in showcasing to the world the versatility of Malaysia's wood resources and their strength, which make them suitable for heavy and medium applications in buildings.